Malamor was formed in 1993 by Ben Kolts and friends. Influenced by the ever growing death metal scene, they soon created the name Malamor (from latin root words Malus Amor) which means "To love all that is evil". They felt that by making their music brutal, but also catchy, they could capture the attention of the audience and keep them moving. Malamor recorded a five song demo in May of 1995 at a twenty four track studio in Bearsville, NY. 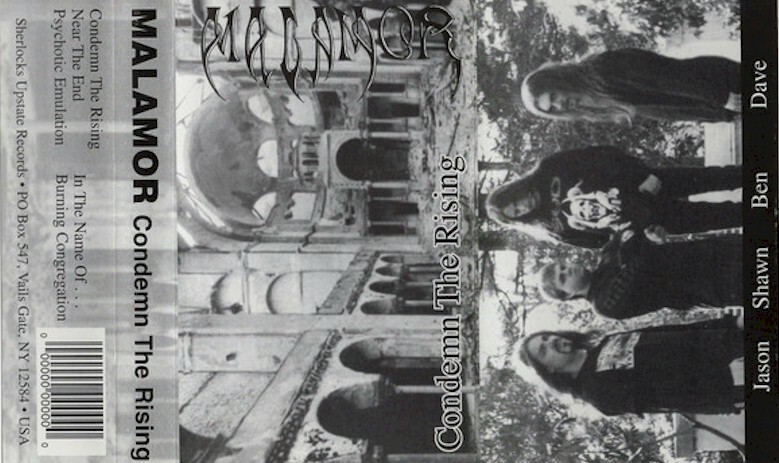 Originally only meant for clubs, this 1995 demo entitled "Condemn The Rising" became widely sought after by fans of the local death metal scene. In early 1997 "Condemn The Rising" was released through "Sherlocks Upstate Records" and sold out of the first 500 tapes in only a few months. Malamor re-ordered more and has been selling copies ever since. Multiple songs on this demo have appeared on various underground CD and cassette compilations. Malamor released their full length CD "Dead To The World" featuring guest backup vocals by Frank Mullen of Suffocation in May of 2004 through Amputated Vein Records.